Citation Information: J Clin Invest. 2005;115(12):3613-3622. https://doi.org/10.1172/JCI25342. Previous research on proteins that inhibit kidney stone formation has identified a relatively small number of well-characterized inhibitors. Identification of additional stone inhibitors would increase understanding of the pathogenesis and pathophysiology of nephrolithiasis. 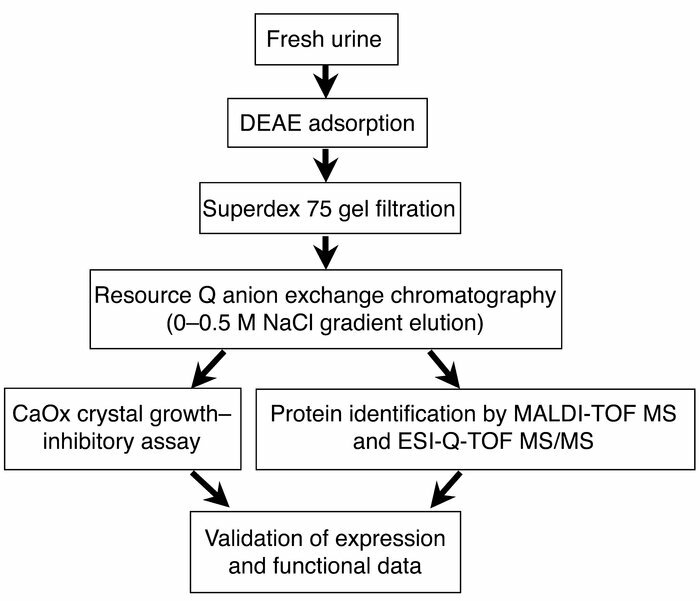 We have combined conventional biochemical methods with recent advances in mass spectrometry (MS) to identify a novel calcium oxalate (CaOx) crystal growth inhibitor in normal human urine. Anionic proteins were isolated by DEAE adsorption and separated by HiLoad 16/60 Superdex 75 gel filtration. A fraction with potent inhibitory activity against CaOx crystal growth was isolated and purified by anion exchange chromatography. The protein in 2 subfractions that retained inhibitory activity was identified by matrix-assisted laser desorption/ionization–time-of-flight MS and electrospray ionization–quadrupole–time-of-flight tandem MS as human trefoil factor 1 (TFF1). Western blot analysis confirmed the mass spectrometric protein identification. Functional studies of urinary TFF1 demonstrated that its inhibitory potency was similar to that of nephrocalcin. The inhibitory activity of urinary TFF1 was dose dependent and was inhibited by TFF1 antisera. Anti–C-terminal antibody was particularly effective, consistent with our proposed model in which the 4 C-terminal glutamic residues of TFF1 interact with calcium ions to prevent CaOx crystal growth. Concentrations and relative amounts of TFF1 in the urine of patients with idiopathic CaOx kidney stone were significantly less (2.5-fold for the concentrations and 5- to 22-fold for the relative amounts) than those found in controls. These data indicate that TFF1 is a novel potent CaOx crystal growth inhibitor with a potential pathophysiological role in nephrolithiasis. The schematic summary of analytical procedures in the present study. Normal human urinary proteins were purified using DEAE adsorption (isolation of anionic proteins), HiLoad 16/60 Superdex 75 gel filtration (size separation), and Resource Q anion exchange chromatography with 0–0.5 M NaCl gradient elution (charge separation). The protein in the pooled fraction with potent inhibitory activity against CaOx crystal growth was identified by MALDI-TOF MS and ESI-Q-TOF MS/MS. Expression and function of the identified proteins were then validated.